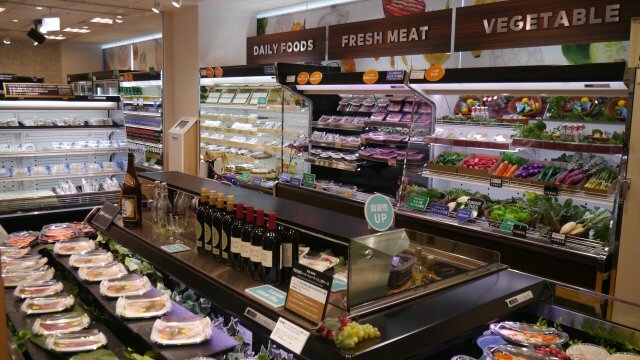 Supporting the Energy and Labor Saving of Food Distribution Systems by "CO2 Refrigerant" and "IoT/AI"
Panasonic's solution for the food distribution industry supports supermarkets, convenience stores, restaurants and logistics. As a response to worksites becoming apparent manpower shortage and to the concept of creating environmentally friendly stores, Panasonic is focusing on providing total support for an energy and labor saving solution. 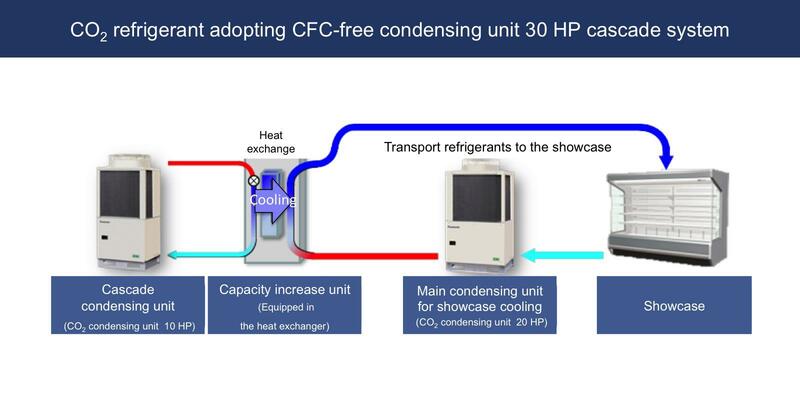 Here, the adopting CO2 refrigerant CFC-free condensing unit, which was achieved with Panasonic's refrigeration technology, and the remote data services that support the cold chains of supermarkets and grocery stores, will be introduced. Against the backdrop of global warming, the flow of CFC-free refrigeration technology is accelerating throughout the world. In the Montreal Protocol, which was adopted in 1987, it was determined that all substances such as specified chlorofluorocarbons (CFCs) that carried the risk of depleting the ozone layer would be abolished in developed countries by 1996, and that hydrochlorofluorocarbons (HCFCs) would be completely abolished by 2020. The alternative CFCs (hydrofluorocarbons/HFCs) used in place of the specified CFCs did not affect the ozone layer, but they were found to be a cause of global warming due to the greenhouse effects, which were several hundred to several tens of thousand times of carbon dioxide (CO2), and became a regulated substance in 2016. It was decided that HCFCs emissions would be reduced up to 85% in developed countries by 2036. However, in Japan, for example, HFCs are still used in approximately 50-60% of food retailers. With zero ozone depletion potential and low global warming potential, CO2 is gathering attention as a next-generation refrigerant. 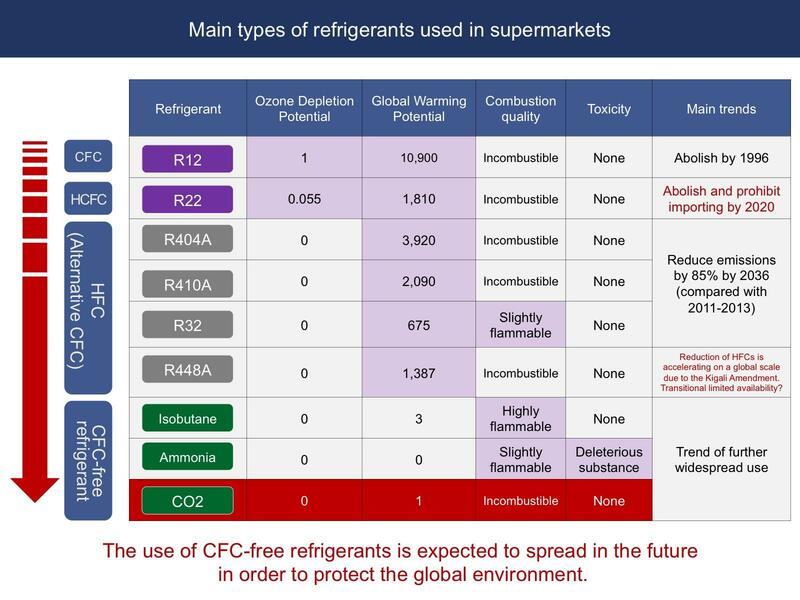 Among the natural refrigerants, Panasonic has used the incombustible and non-toxic CO2 as a refrigerant to develop a CFC-free refrigeration system and they have been supplied to supermarkets and convenience stores. 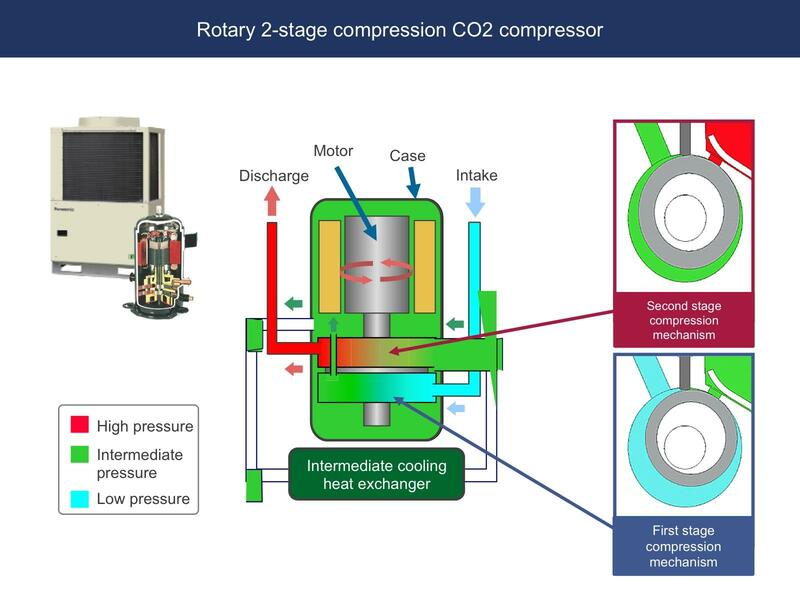 The biggest feature of Panasonic's CFC-free condensing unit is its central component, the "rotary 2-stage compression CO2 compressor." Compared to using HFC refrigerants, the high pressure is approximately four times greater when using CO2 refrigerants, and there is approximately five times the pressure differential between the low pressure and high pressure. Therefore, Panasonic newly developed a compressor to resolve various problems, such as the strength, leakage, reliability of sliding parts and components, high efficiency and weight saving. The newly developed compressor increases the working pressure, so the compressed CO2 is passed through an intermediate cooling heat exchanger and returned to inside the compressor, and by re-compressing it, obtains a sufficient working pressure to handle the CO2 refrigerants. Based on the actual results, 25.4% energy-saving effects and 71% CO2 reduction effects were achieved with the freezer systems at supermarkets. 16.2% energy-saving effects and 65% CO2 reduction effects were achieved with the refrigeration systems. The sales performance in Japan in 2017 reached a total of 3,100 stores. Also, demonstration experiments and installation of the system has begun in 20 countries throughout the world since 2015. This product's lineup consists of five types: The 2 horsepower (HP) model that is primarily used in convenience stores, the side flow 10 HP model, and the 10, 15 and 20 HP models that are used in supermarkets. Furthermore, the release of a new 30 HP cascade system is expected during the spring of 2018. 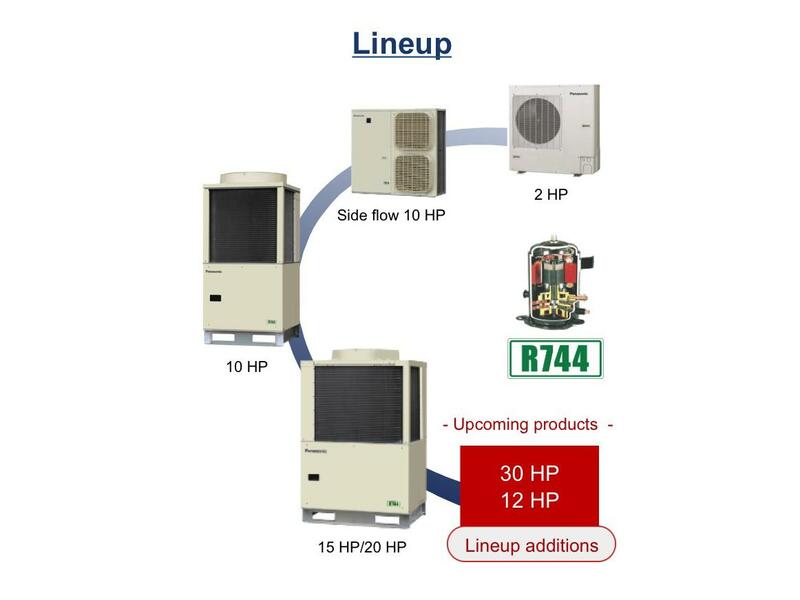 Cascade means to "connect something together," and by connecting the capacity increase unit for additional heat exchange to the cascade condensing unit, the heat-exchange capability has improved by 1.5 times, and combining it with a standard system can increase the degree of super-cooling. The new products provide high operating efficiency and compared to HFCs (R404A), approximately 10-15% of power consumption has been reduced. Also, due to the enhanced output power, the number of refrigeration systems can be reduced compared to when using multiple small output systems, and the both space required for installation and construction costs can be decreased. While immediate global warming countermeasures are being demanded, Panasonic's CO2 refrigerant adopting CFC-free condensing unit, which achieve significantly reduced CO2 emissions and high energy-saving effects, are gathering a great deal of attention. 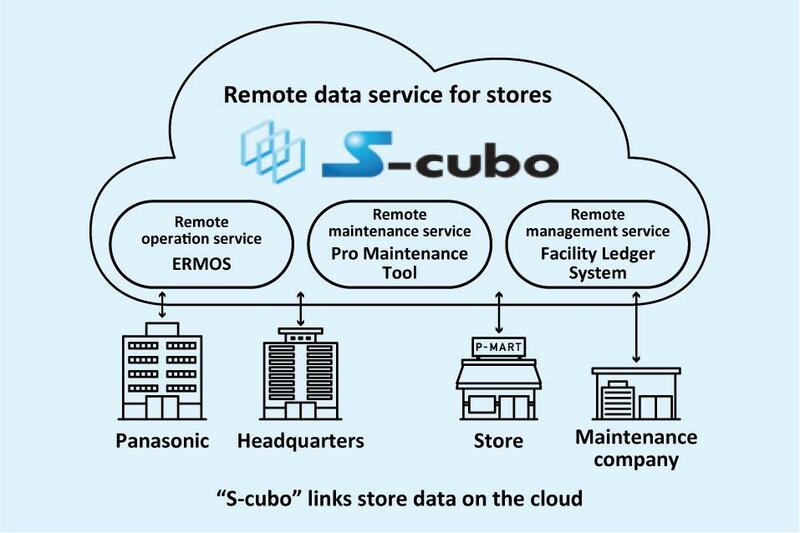 By providing the "Remote data service S-cubo," which conducts supporting for freezer, refrigerator, air conditioner and lighting systems, to supermarkets and food retailers, Panasonic contributes to increased energy and labor saving. For example, the various issues held by business operators, regarding how to comply with the CFC emission reduction laws, maintaining and managing store facilities, energy-saving and store development, can all be resolved by managing the facilities of each store remotely. Currently, the system is used in 15,000 stores throughout Japan. S-cubo is comprised of the following three cloud services. (1) The remote operation service "ERMOS," which started in 2009 as a tool to visualize electrical power and temperature. (2) The remote maintenance service "Pro Maintenance Tool," which analyzes a device's operating data when an abnormality occurs and detects problem areas at an early stage. (3) The remote management service "Facility Ledger System," which enables users to centrally manage and easily browse information of a wide range of facilities and equipment from the Internet. By merging these services, integrated data can be provided to customer remotely to help manage energy, temperature quality, facilities and maintenance. The "S-cubo +Cs" service, which supports the installation, maintenance and energy-saving operation of refrigerated showcases and commercial refrigerators, began in April 2017. The service can analyze big data collected from the cloud, detect equipment abnormalities at an early stage, analyze problems with energy usage and conserve energy by linking equipment operation. In 2017, Panasonic acquired Arimo Inc., a US-based data analysis company. Using their technologies, the services to analyze and use data of commercial equipment in cold chains have expanded. With the use of AI, Panasonic aims to provide even more advanced services, such as the integrated energy management of stores including equipment malfunction forecasting and air conditioning management.